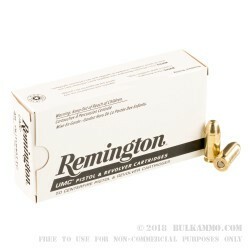 The Remington UMC ammunition line is one of longest running ammo lines in the USA. 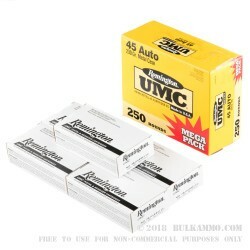 The UMC or Union Metallic Cartridge ammo is a well-known brand in the pistol world, both for high quality products and its incredible value for the cost. UMC has been putting out ammo for 150+ years now, and they are still innovating, designing new products, and providing the same quality ammunition they always have. 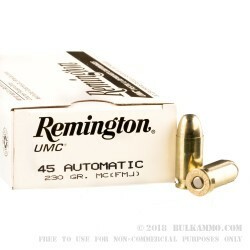 These UMC .45 ACP (Automatic Colt Pistol) cartridges are loaded with a 230-grain full metal brass jacket bullet (mc/metal case) with a reloadable, non-corrosive, Boxer primed, high polished, thick walled full brass case. These 230 grain rounds have a muzzle velocity of 835 feet per second with a muzzle energy of 356-foot pounds of hard hitting 45 ACP! 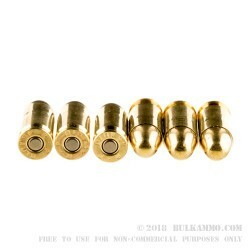 They have two hundred and fifty rounds in each case, with 5 packs of 50 rounds each, you can afford to spend many hours at the range with your family and friends, shooting your best 45 ACP platforms. 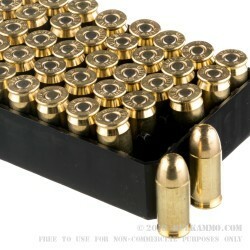 Get yourself multiple cases to stock your armory up to the ceiling and keep your mags full for months to come. A steal for the Price.